Pastel on paper, 400 x 300 mm. An older woman is staring into space with a thoughtful expression. She is wearing an elegant black bonnet on her head that matches her black dress. By having the dark outfit and background stand in sharp contrast to her fair skin, the eye is naturally drawn to her face, where she is wearing an expression that is both withdrawn and expressive. The varying folds of her black clothing have been carefully reproduced with differing shades of grey. The angling of her body towards the right from the viewer’s perspective reveals that the portrait has originally been one or two, where her husband, the Reverend Tidemand, would have been depicted facing left towards his wife. 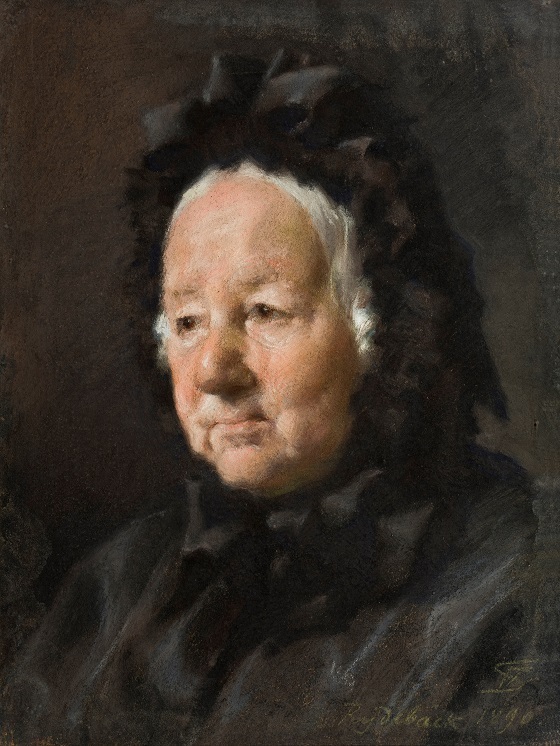 The portrait was in all likelihood completed during one of the artist’s visits to the Rydebäck estate, owned by Johannes Hage’s sister, Vilhelmine Heise.